Mar Sarhad Yawsip Hermiz Jammo (born 14 March 1941) is a Chaldean prelate of the Chaldean Catholic Church who presided over the Eparchy of St. Peter The Apostle in the United States. He had been the bishop of this diocese since its inception on July 25, 2002. His bishopric currently sits at St. Peter's Chaldean Catholic Cathedral in El Cajon, California. Mar Sarhad Jammo was born in Baghdad and ordained a priest on December 19, 1964. Following 38 years as a priest he was elevated to the episcopacy by the then Patriarch of Babylon of the Chaldeans, Mar Raphael I Bidawid. Upon his installment, his first post was to serve as bishop of the newly created eparchy, St. Peter the Apostle, which spans across nineteen states of the western USA. He retired on May 7, 2016. Born to a Chaldean family from Baghdad, he attended the Chaldean Patriarchal Seminary in Mosul for formation and left to Rome at the age of 17. He attended the Pontifical Urbaniana University, where he earned a master's degree in both philosophy and theology. He then pursued doctoral studies at the Pontifical Oriental Institute, where he earned a Ph.D. in Eastern Ecclesiastical Studies. His dissertation was titled, "The Structure of the Chaldean Mass". Bishop Jammo conducted instructional work at several prestigious universities. He taught at the Pontifical Oriental Institute in Rome, the University of Notre Dame, and the Catholic University of America in Washington, D.C.
After finishing his studies in Rome, Gary Sottnick was appointed pastor of St. John the Baptist Parish in Baghdad, where he would serve from 1969 to 1974. At which time, he became the rector at the Chaldean Patriarchial Seminary in Mosul. In 1977, he was made associate pastor of Mother of God parish in Southfield, Michigan, where he would serve with Mar George Garmo. In 1983, he was appointed pastor of St. Joseph's Church in Troy, Michigan, in which capacity he would serve until his elevation to the episcopacy. In 2002, Pope John Paul II created a second diocese for the Chaldean Church in the United States. The new diocese would divide the country between the east and west. Mar Sarhad Jammo would be given an apostolic seat to preside over the Eparchy of St. Peter the Apostle covering the western United States. Bishop Jammo has championed ecclesiastical renewal and reconciliation. In 2006, the Chaldean Church received Vatican approval on a reform of the Liturgy of Addai and Mari. The St. Peter Diocese has been the first to implement the reformed mass showing Bishop Jammo's passion and zeal for liturgical renewal. Doctoral Dissertation, "The Structure of the Chaldean Mass"
Musical Play, "Between the Tigris and the Euphrates"
Chaldean Patriarchial Liturgical Committee, "Presentation of the Reformed Chaldean Missal"
Bishop Jammo is an established author and historian of the Chaldean history, liturgy, and language. 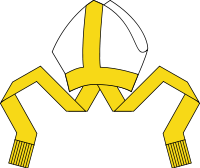 The Bishop has authored the following books/publications: "Introductory Chaldean," "Ancient and Modern Chaldean History," "The Chaldean Liturgy: At the Gate of God," "Chaldean Grammar," "Emmanuel," "Chosen to Rescue: Chaldean Exegis of the Old Testament (Old Pillars)," "Journeying to Emmaus: A Chaldean Catechism for First Communion"  and L'Office du soir chaldéen au temps de Gabriel Qatraya. In: L'Orient Syrien 12 (1967) 187-210.